Restoring Panggau Libau: a reassessment of engkeramba’ in Saribas Iban ritual textiles (pua’ kumbu’). Thirty-one years ago at Seputin, just across and slightly upriver from where we met, Derek Freeman told me that Iban folklore “probably exceeds in sheer volume the literature of the Greeks.” At that time, I thought Freeman excessive. Today, I suspect he may have been conservative in his estimate (Sutlive 1988: 73). Panggau Libau is the mythical home of the brave and handsome archetypal cultural hero Keling and his clever and beautiful wife, Kumang, the patroness of weavers, Iban mythology resounds with their exploits, Iban chants hymn their praises, and Iban woven textiles capture their reflections. That is, until recently. New research has concluded that the anthropomorphic forms in Iban textiles, commonly referred to in the literature as engkeramba ‘, which portray, among others, these cultural heroes, are no more than space fillers, mere cartoons, or insignificant dolls (Gavin 2004). This conclusion represents a paradigm shift that flies in the face of centuries of Iban weaving tradition, and has curators rewriting their data and collectors reevaluating their masterpieces. As an Iban who is an eighth-generation descendant of at least five generations of master Saribas Iban weavers, I would like to offer a reassessment of what these engkeramba’ actually mean and address this recent argument which runs counter to some of the most fundamental adat of our weaving tradition. To truly understand Iban ritual textiles is to understand Iban cosmology. (1) The two are inseparable. Iban ritual textiles are, in essence, canvasses on which Iban myths, philosophies, stories, and histories are woven (see Kedit 1994:154). Disfigure the main characters of these narratives and you maim the stories they tell, in the process completely missing the point and ultimately failing to see the forest for the trees. Here, I make my argument based on the pua’ kumbu’ depicted in this essay, all of them woven by my great-grandmother, Sendi anak Ketit (1892-1974) (2), who was acknowledged by her peers as a master weaver and principal master dyer in the Saribas during the later years of the Brooke era. In the Saribas, not every weaver may weave the engkeramba’. It is one of the fundamental conventions of weaving that only a weaver who, among other attributes, possesses pengaroh (6) may weave these images that depict spiritual beings. Anthropomorphic forms are believed to be spiritually imbued and therefore potentially harmful. A weaver protects herself from these dangerous spirits by using pengaroh. These pengaroh are bestowed by the goddesses and mythic heroines and only to women who have spiritual relationships with them. These women are then acknowledged by the community as being spiritually mature. In all instances in the Saribas, these women came from leading families whose men were leaders of the community. These male leaders (7) were also believed to be successful because of the protection of the gods and goddesses who also gave them pengaroh. In turn, these men and women made no secret of the patronage of their deities and usually ascribed their successes and accomplishments to their divine patrons. Women who did not own pengaroh would not weave the engkeramba’ for fear of being alah bulu enda’ kering semengat (8) and therefore struck layu or busong (9) by the spiritual beings whom they might have attempted to portray, or by the gods and goddesses for failing to observe convention. These weavers would instead depict spiritual beings in abstract forms and never utter their names. The Orang Kaya Pemancha Dana Bayang was succeeded by his son the Orang Kaya (18) Aji Peti Malaya Duat Pengiran Bunsu (19) who was described as one of the most cruel and treacherous headhunters of those days. (20) The Orang Kaya Aji Peti Malaya Duat Pengiran Bunsu’s daughter, Mindu, married Panglima Budin Gerasi, great-grandson of Unggang Lebor Menoa, a rival chief from the Upper Layar. (21) This arranged marriage pacified the “smouldering dispute between two iban families, like the feud between the Montagues and the Capulets, an important factor in local politics for years” (Pringle 1970:108). Panglima Budin Gerasi (22) pioneered the cultivation of coffee and rubber in the Saribas, and was to become the head of an extended kindred. As an ostentatious sign of his family’s unrivalled leadership of the Saribas, Budin Gerasi instituted the adat Burik Menaul Beragum Bejugu (23) as his family’s bulu manok. “Among the first planters [of coffee] were leading Iban families in the middle Saribas who established their gardens early in 1889 and obtained their first output in 1892. In 1895, the Resident reported: ‘The Stambok [i.e. Stambak] gardens are being enlarged. Gergasi [the Malay version of Budin’s praise-name], the head of the house there owns quite eight hundred trees and employs labour (Dyak). His paddy farm this year was made for him by Malays on wages'” (Cramb 2007:178). “In the riverine zone at Stambak, below Betong, the headman Budin (the coffee planter of the 1890s mentioned above) planted over 4,000 seedlings [of rubber] in 1909, with seed brought back from Singapore by his son Lumpoh. Another early planter, Penghulu Saang, obtained seeds from Stambak to plant at Pelandok in the Paku branch of the Saribas in 1912” (Cramb 2007:183). This venture further strengthened the family’s economic and social position. “The Saribas Iban ‘experienced unparalleled material prosperity’, enabling further investment in agriculture, business and trading, as well as the construction of ‘palatial’ ironwood longhouses and the celebration of elaborate gawai festivals on an unprecedented scale” (Cramb 2007:184, quoting Sather 1981: 27-9). Pringle succinctly commented that “it is no exaggeration to say that any knowledge of Saribas history in the Brooke era begins with knowledge of this family” (Pringle 1970: 57). Mengan married her first cousin, Tuai Rumah Ketit, the son of Budin Gerasi’s brother. Her daughter, Sendi anak Ketit (known as Indai Gumbek (29) to her peers), was born in 1892 in Stambak Ulu, Layar, Saribas. She lived until the age of eighty-two and left behind a textile legacy (30) replete with graphic representations of the various personalities, mythical beings and deities who populate the Iban pantheon. Sendi was posthumously named indu ‘pandai pengelandik jari nadai pemali tau ‘jait tau ‘nyungkit tau ‘anyam tau’ sulam tau ‘nakar tau ‘gaar (clever woman with skillful fingers and no ritual restrictions who is a master of embroidery, sungkit, pilih, warp wrapping, and preparing cotton for dyeing) (31) and was accorded sigi’ alas ngerang (32) by the elders of her community at her funeral wake. Sendi, in the course of her long career as a weaver, wove the entire known gamut of the engkeramba’ on her pua’ kumbu’, as I shall attempt to explain in the following pages. As early as her first pua’ kumbu’ (also known as the pua’ penuai, or ‘the oldest pua’, (Plate 2) which depicts a series of clouds (pendants enclosing abstract medallions which allude to certain members of the Iban pantheon) called Tangga’ Remang, Sendi was already creating anthropomorphic forms. (33) The term Tangga’ Remang is a form of jako’ karong, very much like the euphemistic engkeramba’, alluding to the actual title, Tangga’ Beji, ‘Ladder to Heaven,’ referring to a legend telling the story of how an Iban ancestor, Beji, attempted to build a ladder to reach the heavens, but ultimately failed. His ladder broke into pieces, fell back to earth and became rivers. Intrinsic is the lesson that human beings may not become gods, though they may aspire to godly values and virtues; Sendi’s first lesson in spirituality. The Tangga’ the cloth in search for food to devour. To the Iban mind, all beings require nourishment, even those on textiles. These headless torsos are positioned in the center of the passages that act as portals for the greater spirits encased in their pendants, like offerings on a threshold (Plate 4). This motif has become a recurring symbol found on almost all of Sendi’s family’s pua’ kumbu’. Towards the middle of the last century, other Saribas women began to copy this symbol and incorporate it into their Remang also refers to ‘The Coming of the Gods,’ when used by bards during festivals. This engkeramba’ (Plate 3, headless torso with hind limbs) is the motif used by the women of Sendi’s family to symbolize a food offering that is being fed to the “spirit” (34) of the design being created. The torso missing its head is a reference to headhunting, a graphic representation of the offering being “vanquished” and consumed. This appeasement is a requisite that restrains the spirit of the design from “escaping” designs. This engkeramba’ has become a symbol signifying a sacrifice and is universally identified as such throughout the Saribas. Another method by which weavers “trap” a spirit is by the use of a sharp-edged duri’, or thorn (Plate 5), at the entrance or exit of a passage. This symbol effectively blocks a spirit from escaping (Plate 6). Any sharp object becomes an effective spiritual barrier or weapon. In weaving these symbols, Sendi was learning a fundamental lesson from her mother: designs have spirits which are potentially malevolent and may harm the household if not appropriately “fed” with food offerings or “fenced in” with sharp objects or stronger designs. The headless engkeramba’ that Sendi wove therefore represents a lesser spirit being offered to the greater spirit of the design. The engkeramba’ in the context of this pua’ kumbu’ therefore does not just fill space for no apparent reason, but is integral to the space it fills with the main reason being to protect the weaver and her household from harm from the greater spirit in the design. Sendi wove the popular (35) design known as Bali Bugau Kantu’, the Enemy’s Cloth (36) after “graduating” (37) with her tenth pua’ kumbu. 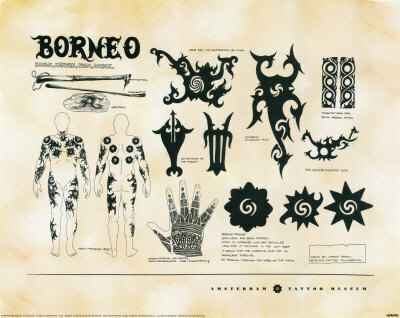 Although the original meaning of this design is unknown, the Bali Bugau Kantu’ has come to be known in the Saribas as retelling the legend of Remi whose brothers were murdered by the Kantu’; a story that instructs the Iban on the origin of mortuary rites (see Sandin 1994: 94-98). In the legend, the corpses of the three brothers each metamorphosed into a different animal, (38) all depicted by Sendi in the design of this pua’ kumbu’ (Plate 7). The powerful spirits of these creatures inhabit this pua’ kumbu’ and, as such, must be properly “fenced in” with strong fringe patterns. At the punggang kemudi (end fringe) Sendi positioned the Gerasi Nabor Menoa or ‘Giant that Sows the Earth’ [with seeds] (Plate 8) while at the punggung pun (point of origin fringe), she placed the Sepit Api or Fire Tong (Plate 9) which coincidentally encases engkatak or small frog-like figures on the end border (Gavin 2006: 247). The Gerasi Nabor Menoa is enclosed within a pendant with its head facing the indu’ buah or main pattern of the pua’ kumbu’, and under its arms are seeds which it guards jealously; a covert reference to a victorious warrior who proudly clutches his trophy heads under his arms after a battle. This giant, whose unspeakable name (39) is Gajah (40) Meram, or ‘Brooding Giant,’ guards the upper fringe. The fire tong is a symbol that is associated with Selampandai (also Selampetoh, Selampeta), the great blacksmith who forges mankind and in Iban cosmology is a brother of the war god Singalang Burong. (41) He is not depicted in this buah punggang but his presence is tacitly acknowledged by the image of the fire tong. As creator spirit, Selampandai guards the point of origin fringe (punggangpun) of the design of this powerful pua’ kumbu’, and for his services he is offered not headless engkeramba’, but ample offerings complete with head and all limbs intact (Plate II). Weavers call it the engkatak (frog) which it closely resembles, but does not actually represent. Frogs would not befit the great blacksmith who created mankind. The term engkatak is used here as a euphemism, or concealed name, to refer to a food offering of a lesser spirit being which has no name. The fire tong, however, does have a name. Its ensumbar (praise-name) is Sepit Api ke Bejari Ragang Ragang, Pengetis ka Simbong Terabang, Ke Bejalai Melit Tisau Langit Besabong Gelang. Another meaning for Sepit Api Bejari Ragang Ragang (42) is to describe a scorpion moving astraddle with its claws. This praise-name is also very similar to the ensumbar of Si Gundi, (43) the father of Keling. Could the fire tong therefore have an alternate or multiple meanings? Iban weavers speak and weave with puns and riddles in order to hide the true meaning of the objects they weave. This is another fundamental aspect of Iban weaving, often misunderstood, which I shall discuss at the conclusion of this article. In the Tangga’ Remang textile (Plate 2), Sendi has also woven the Sepit Api at the punggang pun of the indu’ buah. But instead of “feeding” the fire tongs with an engkatak, she offered them birds instead (Plate 10). Within the fire tongs are sharp jagged “teeth” that devour the offering. Consistently in all her pua’ kumbu’ showing the fire tong, Sendi wove this motif at the point of origin fringe of the indu’ buah. This is also true of almost all of the pua’ kumbu’ found in the Saribas. Could the fire tong then be an explicit homage to the creator spirit by the weaver in seeking assistance in “creating” the spirit of the indu’ buah? The engkatak and burong are therefore not filling an otherwise empty space as decorative items, but are integral to the pattern in appeasing the unseen Selampandai. Being sacrificial subjects, the engkatak and burong make the buah punggang not only visually arresting, but, more importantly, ritually complete and therefore spiritually safe for the weaver and her household. While the men of leading families pursued the activity of headhunting, which was a prerequisite to celebrating the Gawai Burong, their women, in turn, wove the designs of the various degrees of the festival as the ultimate status-marker of their own achievements as weavers of leading families. A wife or daughter of a leader was expected to weave at least one ritual shrine design; preferably the degree most befitting her husband’s or father’s status so that it could be used at the celebration of the same degree of the festival. The main pattern of the Tiang Sandong Betong is made up of actually two indu’ buah; the Sandong Betong proper and its spiritual reflection, the Nibong Berayong. The lower half displays the Nibong Berayong which grows in Sebayan, (54) the spiritual reflection of the temporal Sandong Betong shrine which occupies the upper half. Both designs have their own personal ensumbar which therefore means that this pua’ kumbu’ can be called by either of the two names. Central to both designs is the trophy head which is at the core of the ritual shrine of the fifth degree, depicted graphically in the design of the Sandong Betong, but only alluded to in the design of the Nibong Berayong. The trophy head is a recurrent theme in almost all Iban textiles because it is central to both the cults of headhunting and fertility. It is known by a plethora of names, the more common and utterable ones being buah (fruit), igi’ (seed) and leka (round object). As far as the weaver is concerned, the trophy head is also called an engkeramba ‘, as the motif comprises a visage with eyes, mouth, and teeth. A weaver must take every precaution to ensure that her spirit is not overwhelmed by the spirit of the trophy head that she attempts to capture onto cloth. A weaver creates the motif of the trophy head as a testament to her spiritual maturity. It is a defining point in her spiritual journey. Like an Iban warrior who would have gone on a raid to bring back trophy heads and so earn fame for himself, an Iban weaver would do the same, but in cloth. There is nothing comical in the grimace of the figure, and all weavers take the challenge to weave the trophy head motif very seriously. In this, her penultimate pua’ kumbu’, Sendi created a new interpretation of the terrifying demon, Gerasi Papa, or Ravenous Demon, otherwise known as Nising or Antu Beduru in the Saribas. In this pua’ kumbu’, Nising, almost ghost-like in a fashion familiar to the western eye (Plate 16), is depicted as “chained and captured.” Nising is not offered any food offering in the form of engkatak or engkeramba’ simply because it is the offering. The motif is also kept very small, in deference to the gods who find images of other creatures besides themselves repugnant. Weavers “graduate” to motifs of demons after weaving motifs of trophy heads. This is a challenge only very few would attempt, as the spirit of a demon greatly eclipses that of a trophy head. When a weaver, without getting ill or beset by misfortune, successfully completes a pua’ kumbu’ that displays an engkeramba’ representing a demon, it is a sign of her triumph over the spirit of the demon. This is a great status-marker for any woman. In Iban cosmology, Nising is only defeated by Singalang Burong, the patron deity of war. (58) For a weaver to depict Nising, not only is she retelling the epic battle, but also covertly indicating her spiritual maturity. Sendi’s final pua’ kumbu’, the Ranyai Beduju, is a visual celebration of Iban cosmology. It shows the earthly ritual shrine of the eighth degree, the Tiang Ranyai (upper half, or indu’ buah kemudi) as well as the spiritual Ranyai Beduju that flourishes in Sebayan (lower half or indu ‘buah pun). In the upper half, Sendi portrayed creatures that take an earthly form, while in the lower half she depicts the scene in Sebayan as she imagined it. In the upper half of the main pattern, sons-in-law of the war-god Singalang Burong, disguised in their earthly form as omen birds, herald the coming of their unseen father-in-law, while Keling, in his earthly form of a serpent with shiny scales, rests by the ritual shrine made of spears with sharp tips that have been used in fighting the enemy (Plate 18). On the lower half of the pua’ kumbu’, however, Sendi depicted a realistic scene from the afterlife and wove the most significant engkeramba’ in her entire career as a weaver: Keling Aji, Pemayoh Bini Banyak Rambang; Kiai Anyai, Penyambut Sakai Pemanggai Lintang; Keling Aji Berani Ati, Tau ‘Serang; Gerasi Nading, Bujang Berani Kempang, (59) himself, crowned with a labong (60) of feathered plumes and enthroned on a pedestal called the papan penvadih (Plate 19). Sendi portrayed the cultural hero god resplendent in all his glory. He occupies a space that is lushly decorated with extra coils (pengalit) and tendrils (bubul) to honor and celebrate his presence. In his arms are trophy heads. Towering over hint is the great Ranyai Beduju with swaying branches and palm fronds fruiting abundant bunches of trophy heads. During Gawai Burong, the heroes of Panggau Libau were always invoked first by the host. The host then sought their assistance to beg the gods of Tansang Kenyalang to grace his festival. The mythic heroes of Panggau Libau therefore assume an important role in the Iban pantheon as mediators between the Iban and their gods. (61) This is the reason why they are depicted on pua ‘kumbu’ woven for the Gawai Burong. Weaving the engkeramba’ of a god is the only exception to the convention of “capturing” the spirit of the engkeramba’. Instead of using pengaroh to protect herself, the weaver seeks the permission of the god being portrayed by preparing a tabak piring (tray) that contains a piring (plate of offerings), blood-stained feathers of a sacrificed fowl, and the baku’ pinang (box of betel nut and sirih leaves), and offers these with invocations to the god. The weaver does not attempt to capture the spirit of the god, but, instead, she attempts to best portray the god in an anthropomorphic form; the ultimate honor for a weaver. Once completed, this engkeramba’ becomes the exclusive “‘property” of the bilik, a copyright that can only be teladan (copied) or ngangkat (copied with improvements made) by her descendants. Weavers from other leading families may “buy” these designs by paying a ritual fee stipulated by the owners. The ability to weave an engkeramba’ representing a god is also an indication that the weaver is nadai pemali (without restrictions) and may weave any design. The state of being without restrictions is coveted by all weavers. However, it is a state that cannot be achieved through any personal means or accomplishments. It can only be bequeathed by a god or goddess. This gift is communicated in a dream encounter, which must be confirmed by an elder who has had a similar dream. (62) Often, this gift is manifested as a new growth or mole on the base of a thumb or fnger. When asked to name this motif of the god Keling, a weaver would lower her eyes modestly and ask a fellow weaver, often someone more spiritually mature than her (a grandmother, mother, or older sister), to utter it instead. The name spoken by this fellow weaver would almost always be the ubiquitous: buah engkeramba’ (the engkeramba’ design) or gambar aja’ (just a picture). (v) the engkeramba’ is a copyright motif and a monopoly reserved by weavers of leading families. Why, then, has the engkeramba’on Iban textiles been so misunderstood? Sometimes we forget that the Iban weaving tradition is essentially an activity shrouded in secrecy, albeit, the basic and more pedestrian aspects of weaving are common knowledge. As a weaver develops in skill and spiritual strength, she attracts attention and sometimes jealousy. The adage that “knowledge is power” holds true in the context of Iban weaving. Having access to esoteric knowledge means having control over the more esoteric aspects of weaving. Such insider knowledge and trade secrets, as it were, would only be shared between mother and daughter. When pressed by a stranger, an Iban weaver would most likely change the subject or deliberately render the subject matter insignificant with dismissive nonchalance. Against this backdrop of the weaver’s reticence to divulge precious information, one begins to understand why a weaver would deliberately mislead the uninitiated and gullible. We should also be prepared to acknowledge that perhaps many of the informants who have supported research into Iban textiles are simply ignorant of the very esoteric subject of the engkeramba’ and how weavers from leading families correlate it with the spiritual beings and personalities that make up the complex Iban pantheon. The engkeramba’ has been monopolized, at least in the Saribas, by a small pool of master weavers from leading families of the area, and any knowledge about it has been closely guarded (up until now). Only a handful of very old weavers in the Saribas know the secret names of the engkeramba’, much less their descendants, who are young weavers who attend classes and workshops to learn the practical methods of weaving. Show an engkeramba’ to one of these young women and she will most likely have no real idea of what it means, and feign laughter to camouflage her ignorance. It is almost like showing hieroglyphs to an Egyptian on the streets of Cairo and then asking him or her to decipher the text. To fully comprehend the multi-layered narrative of any anthropomorphic form on Iban textiles and to conclude authoritatively on it, one must first understand the mindset of the weaver who wove it and her worldview. One must also be fluent in the Iban language and conversant with its deceptive subtleties in order to decipher the metaphors a weaver often uses. Finally, incumbent is the possession of a comprehensive and near encyclopedic knowledge of Iban oral history, adat, and cosmology, as it is from this vast ocean of knowledge that a weaver draws her subjects and is consequently inspired to weave her statements. She becomes storyteller, historian, magician, and archivist and the engkeramba’ she weaves are her protagonists and antagonists. I shall defer respectfully to my elders and let them have the last word on the matter of the engkaramba’. Datuk Sri Empiang Jabu, from the Saribas, in describing the design of a high-ranking pua’ pattern woven by her grandmother, writes, “this pua kumbu comes from the Saribas area where there are restrictions on the weaving of human forms, and for this reason the face of Nising is of minimal size” (Jabu 1992: 82). She explicitly states that “these designs depict human-like figures or engkeramba and they symbolise the spirits and gods” (Jabu 1991: 6). The late niang Datin Amar Margaret Linggi, from the Julau who married into a leading family of the Baleh, was more emphatic, stating that “figures in any pua pattern are not human but “other beings’ which may harm the weaver if their names are spoken. The reader should take notice that any figure also is surrounded by a circle or some other form, such as a buah bangkit shape, the surrounding shape being intended to protect the weaver from harm by the image” (Linggi 2001: 30). (italics and bold, mine). When two Iban authorities on the pua’ kumbu’, each from a distinct weaving tradition, agree on a common point that anything which resembles an anthropomorphic form is potentially forbidden and should therefore be approached with care, one should pay close attention. It would seem, therefore, that the Iban are in agreement with Haddon who, despite flaws in some parts of his magnus opus, was spot-on when he wrote that the engkeramba’ “may be made only by the wives and daughters of chiefs, and even they must begin by making other patterns” (Haddon and Start 1936: 124). The heroes and heroines of Panggau Libau, in mediating for the Iban by allowing their images to be depicted on cloth, would otherwise be much offended. The following generously gave their time, advice, and assistance during the writing of this paper, for which I am deeply grateful: Pamela A. Cross, Temenggong Matthew Dana, Michael Heppell, Peter Kedit, John Kreifeldt, Gregory Mawar, Nazrah Anwar, Sandra Niessen, Christine Padoch, and Clifford Sather. Baring-Gould, S. and C. A. Bampfylde 1909 A History of Sarawak under its Two White Rajahs, 1839-1908. London: H. Sotheran & Co.
Cramb, R. A. 2007 Land and Longhouse: Agrarian transformation in the uplands of Sarawak. Copenhagen: NIAS Press. Davison, J. and V. H. Sutlive 1986 The Children of Nising: Images of headhunting and male sexuality in Iban ritual and oral literature, in: Vinson H. Sutlive, Jr (ed), Female and Male In Borneo: Contributions and Challenges to Gender Studies, Borneo Research Council Monograph Series Vol. 1, Phillips: Borneo Research Council, Inc., pp. 153-230. Gavin, Traude 2004 Iban Ritual Textiles. Singapore: Singapore University Press. Haddon, Alfred C. and Laura E. Start 1936 Iban or Sea Dayak Fabrics and their Patterns. Cambridge: Cambridge University Press. Jabu, Empiang 1991a Pua kumbu, at Seminar Tekstil dan Pakaian Tradisional, Peringkat Negeri Sarawak, September 1-4, Kuching, Sarawak. Unpublished seminar paper. 1991b Pua Kumbu; The pride of the Iban cultural heritage, In: L. Chin and V. Mashman, eds., The Sarawak Cultural Legacy: A living tradition. Kuching: Society Atelier Sarawak, pp. 75-89. Kedit, Vernon 1994 The Pua Kumbu: Sacred Blanket of the Iban of Sarawak, In: Dato’ Haji Sulaiman Othman, ed., The Crafts of Malaysia. Singapore: Editions Didier Millet, pp. 151-59. Linggi, Margaret 2001 Ties That Bind: Iban Ikat Weaving. 2nd ed., Kuching: The Tun Jugah Foundation. Pringle, Robert M. 1970 Rajahs and Rebels: The Ibans of Sarawak under Brooke Rule, 1841-1941. Ithaca: Cornell University Press. Richards, Anthony J. N. 1981 An Iban-English Dictionary. Oxford: Clarendon Press. Sandin, Benedict 1994 Sources of Iban Traditional History. Special Monograph, No. 7, Sarawak Museum Journal. Sather, Clifford 1981 Benedict Sandin, 1918-1982: A biographical memoir. Sarawak Museum Journal, 34: 1-36. 1996 “All Threads Are White”: Iban Egalitarianism Reconsidered, In: James J. Fox and Clifford Sather, eds., Origins, Ancestry and Alliance: Explorations in Austronesian Ethnography. Canberra: Research School of Asian and Pacific Studies, Australian National University, pp. 70-110. Sutlive, Vinson H. Jr. 1988 The Iban in historical perspective, In: Iban in Society: Proceedings and findings of the Seminar Budaya Iban held in Kapit from 27-30 June 1988. 1994 Handy Reference Dictionary of Iban and English. Kuala Lumpur: Tun Jugah Foundation Publications Series. (1) My principal source of information on Iban cosmology is Gregory Nyanggau Mawar from Kerangan Pinggai, Paku, Saribas. Orang Kaya Pemancha Daya Bayang x Mengan Tuai (f) = [1st generation] Orang Kaya Aji Peti Malaya Duat Pengiran Bunsu x Dimah (1) = [2nd generation] Mindu (f) x Panglima Budin Gerasi = [3rd generation] Mengan (1) x Tuai Rumah Ketit = [4th generation] Sendi (13 x Gelau = [5th generation] Inja (f) x Kedit (grandson of Penghulu Sa’ang Rumpang) = [6th generation] Albert Rumpang x Mary (f) = [7th generation] the author. (3) Richards translates it as a “model, doll, esp. carved wood figures in human form …’ (1981:84), while Sutlive defines it as “a doll. a carved image, or a model’ (1994:69). (4) Michael Heppell, personal communication. (5) Riddle. to use words to cover or conceal meaning. (7) Other Iban males had no quahns following these male leaders in war expeditions as they believed that these leaders were virtually guaranteed success through divine intervention. (10) A family unit that occupies a room (or bilik) in a longhouse. (11) For this reason alone, the demon Nising, arch-enemy of the gods, is always depicted minimally, if at all. (12) It is on this fundamental principle that restrictions on the portrayal of anthropomorphic forms are founded in the Saribas and, to some degree, in other Iban regions as well. (13) This is in direct contradiction to Iban cosmology where the gods and mythic heroes preside over demons and ordinarily outrank them, whether on cloth or in the cosmos. (14) Clifford Sather, “‘All Threads Are White’: Iban Egalitarianism Reconsidered” (1996), argues that Iban society is most usefully seen–not as unequivocally “‘egalitarian”–but as structured around an articulation of principles of both “egality” and “hierarchy,” with relations of equality predominating internally–especially within the local longhouse community–in adat and relations within the family and between kindred and affines–while hierarchy is externally derived and. as a rule. valorized within a larger regional society through major ritual gatherings or gawai. (15) A non-hereditary title bestowed by Sherip Masahor, an agent of the Brunei Sultanate. (16) Dana Bayang or Dana “‘the Soaring Eagle,” the latter all ensumbar (praise-name) given to Dana. (17) Journal entry. 12th December 1845, in Mundy, Borneo and Celebes, II, 78. (18) A non-hereditary title bestowed by the Rajah before the Orang Kaya Aji rebelled against the Brooke Raj. (19) Aji Peti Malaya Duat Pengiran Bunsu or “Aji Strong as Steel. Duat the Young Prince,” the ensumbar (praise-name) given to Aji by his wile Dimah. (20) “Saji [Anglicised version of Aji’s name] gallantly attacked, and met the fate he so richly deserved … Saji’s name and acts have been in my ears for years past.” wrote the Tuan Muda [Charles Brooke, the nephew of James Brooke. who was to succeed his uncle as the Second Rajah]. “‘Many a bloody deed had been perpetrated, and be always bad boasted that the White Men’s powder and shot would take no effect on his body. So fell one of the most cruel and treacherous head-hunters of those days” (Baring-Gould & Bampfylde 1909:180). (21) Upper part of the Saribas river system. (23) The very rare coloration of a striped eagle with beard and crest on its head which is used to welcome any member of the Budin Gerasi bloodline to a festival. Failure on the part of the host to receive a Budin Gerasi descendant with this coloration would result in pansa arong (tainting of a fellow guest or a member of the host’s household), indicating that the guardian spirit of Budin Gerasi’s bloodline is not pleased with the protocol accorded. (24) Family oral history recounts how Mindu anak Orang Kaya Aji, on her deathbed, commanded her eldest daughter Mengan anak Budin Gerasi to muntas (operate) her middle finger to remove the charms in the form of stones embedded in her flesh which Indu’ Dara Insin Temaga had given her, and to keep them within the bilik as “inheritance’. (25) As noted earlier, this role is played by Kumang, wile of Keling. (26) Gregory Nyanggau Mawar, personal communication. (27) Secluded child who lives in a meligai (beautiful apartment in the sadau, loft or upper room), often the eldest daughter of a chief, and attended by slaves taken ill wars and their descendants. An anak umbong’s feet are not allowed to touch the ground and she does not leave her meligai until the day of her marriage. (28) An indu takar is a woman who knows the secret measurements of mordant and dyes and conducts the ritual of soaking yarns in a prepatory bath. It is also the highest social status for a woman. A tuai takar is the lead or principal among the indu takar. (29) Indai Gumbek translates as “Mother of Gumbek.” Gumbek was Sendi’s daughter Inja’s nickname, Iban parents are called by the names of their children. (30) These pua ‘kumbu’ are heirlooms of the family and are currently held in trust by the author’s father (as the tuai bilik, or elder of the family room). Information about these textiles was related from Sendi herself to her daughter, Inja, who then transmitted the information to her children. Sendi had also spoken of her textiles individually to her grandchildren, explaining in detail to each one of them their significance and ritual meaning as ‘inherited’ pua ‘kumbu’. The author further interviewed other female relatives who were also master weavers and contemporaries and students of Sendi–Jelia anak Ipa (Indai Nancy, Sendi’s in-law and sister to Kedit who married Sendi’s daughter, Inja) and Lenguti anak Langie (Indai Gulang, Sendi’s niece–daughter of Sendi’s sister Isah) who was later adopted by Langie. brother to Sendi’s father) to verity the oral information which is now being documented for future generations of the family of Budin Gerasi. (31) The highest rank for a woman within the Saribas prestige system where men and women are accorded ranks at their deaths, based on the twofold requisites of accomplishment and ancestry. (32) Sigi ‘alas ngerang is the unit equivalent that indicates that the person was a master weaver who knew the secrets of the takar and gaar rituals. Families descended from Budin Gerasi adhere to adat Unggang Lebor Menoa which is a unique prestige system that differentiates them from other families of the Saribas. (33) This is not typical of Iban weavers, as only women who have charms inherited from their foremothers to protect themselves from harm caused by a premature engagement with the spirits would attempt to weave an engkeramba’ on their first pua’ kumbu’. (34) The Iban believe that all patterns are inherently imbued with spiritual power by the innate presence of the spirit of the design. The spirit is “captured” by the weaver who creates the pattern. (35) This design was woven by almost all of Sendi’s female relatives and Saribas contemporaries for two reasons: (1) as an indicator of technical skill, since the design is complex, and (2) as a covert form of competition between weavers and sibling rivals, to see who could successfully interpret and embellish the most beautiful copy or version of the design. (36) The Bugau and Kantu’ were traditional enemies of the Saribas Iban, and the terms Bugau and Kantu’ have come to be used to mean “enemy.” This pattern is said to have been copied from a pua’ kumbu’ that was looted by Sendi’s great-great-grandfather, Orang Kaya Pemancha Dana Bayang, on one of his raids to West Kalimantan (for an account of some of these raids into West Kalimantan led by Orang Kaya Pemancha Dana, based on Saribas Iban oral tradition, see Sandin 1994: 165-76). (37) A weaver is deemed tembu’ kayu’ (has completed her cycle of widths) on completion of her tenth pua’ kumbu’ and is then allowed to use the white colored band on her outermost lateral selvedge. This white outermost band is a status marker that indicates that the weaver is a master weaver. The esoteric term for a white outermost lateral selvedge is semalau labang, after the feathers of the semalau bird which are colored white against black. (38) A python, a gibbon, and a crocodile. (40) Gajah translates as “elephant” but in esoteric language, it means a creature of great proportions. Another form of the term is gajai which has the same meaning. (41) Gregory Nyanggau Mawar, personal communication. (44) ‘She who knows how to fold the warp and who creates original designs,’ the penultimate status for a weaver. (45) The grandest festival celebrated in the Saribas. (47) Brave warriors who had taken trophy heads. (50) The Gawai Burong has nine ascending degrees. Each degree mirrors a stage in padi cultivation which, in turn, is a coven reference to the cults of headhunting and fertility, as discussed extensively by Julian Davison and Vinson H. Sutlive. Jr. in “The Children of Nising: Images of Headhunting and Male Sexuality in ban Ritual and Oral Literature” (Davison and Sutlive 1986), My principal informant on the Gawai Burong is Temenggong Matthew Dana from Pelandok, Paku, Saribas. (51) These are: 1) Gawai Kalingkang, 2) Gawai Sandong. 3) Gawai Sawi, 4) Gawai Selangking, 5) Gawai Mulong Merangau or Lemba Bumbun or Sandong Betong, 6) Gawai Gajah Meram, 7) Gawai Meligai, 8) Gawai Ranyai or Mudor Ruroh, and 9) Gawai Gerasi Papa. (52) The Bali Belumpong (Divided Cloth), the Bali Kelikut (Blanket of Kumang), the Pua’ Jugam (Black Cloth), and the Bali Menyeti (Beautiful Cloth) are a rank below the designs reserved for the Gawai Burong. The Lebor Api (Blazing Fire) has equal status to any degree of the ritual shrine design as it is used for the Gawai Enchaboh Arong, a preliminary, degree of the Gawai Burong. (53) Sendi wove four degrees of the ritual shrine textiles, beginning with the fifth degree Tiang Sandong Betong (Fig. 12), followed by the sixth degree Gajah Meram (Fig. 7), then the seventh degree Meligai (Fig. 15) and finally the penultimate eighth degree Ranyai Beduju (Fig. 22). (54) The Iban afterworld of the dead. (56) The war-god Singalang Burong’s abode is known as Tansang Kenyalang (Hornbill’s Nest), a great and magnificent longhouse in the Iban cosmos. (57) Not to be confused with the eighth degree of the Gawai Burong, which is also called Tiang Ranyai. The Ranyai Sebayan is the tree that grows in the afterworld where warriors lop off trophy heads suspended from its branches. In the seventh degree, the locus is on the offerings rather than on the ritual pole. (58) Gregory Nyanggau Mawar, personal communication. (60) Male headdress made of bamboo and wrapped with a woven textile called the selampai. (61) Gregory Nyanggau Mawar. personal communication. (62) Dreaming is a salient activity within Iban cosmology, a direct means by which an Iban communicates with the spirit world, and such communication is perceived by a weaver’s peers as validation and endorsement of her undertaking. This entry was posted in MAIN ASAL on April 23, 2013 by uwa1971.